Regular seven-day express services to Limerick (Raheen and Henry St), Cork and Cork Airport. Runs student services from the Kilkee / Kilrush area to Galway, Limerick and Tralee. Run a daily return service from Galway to Lahinch (Co Clare), between April and October, with stops in Oranmore, Clarinbridge, Kinvara, Doorus Cross, Bellharbour, Ballyvaughan, Lisdoonvarna, Doolin / Doolin Pier, Cliffs of Moher, and Liscannor. Targetted at tourists, but locals are welcome. 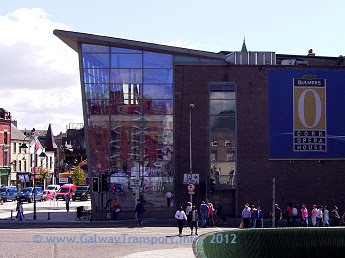 Route x51 - Galway - Limerick expressA seven-day service stopping at GMIT only. Some extra services stop at University of Limerick and Limerick IT also.